Larry King: Last time you were here you were getting ready to open Maude, I told you not to call it Maude, it’s not an attractive name. I now apologize – Maude has received accolades from the James Beard Foundation, Time, Travel & Leisure, LA Magazine, LA Weekly, Eater LA, and Angelino, among others. What made Maude? Curtis Stone: I told you. You said, ‘what are you going to call it?’ I said, ‘Maude’ and you said ‘that’s a silly idea.’ And I’ll never forget it. You thought that I should have called it ‘Stone’s’ or ‘Curtis’’ or something. You know, I think whenever you do something from your heart, if it means something to you then you’ll do a good job of it, and you know to me food’s always been really special and I wasn’t really looking for a job, I was… You know, I was opening something because I really wanted to get back into it. Larry King: But you were on television, right? Larry King: What show were you on? Larry King: Yeah. What was it like to go back to a restaurant? 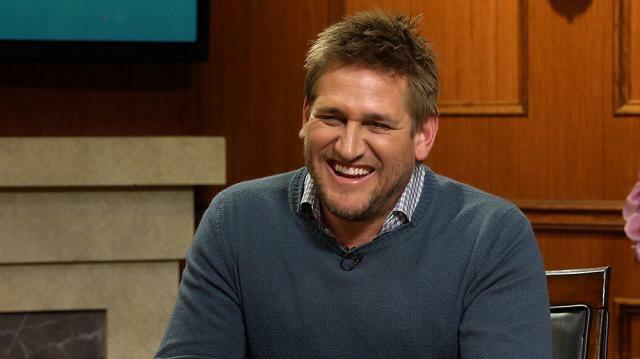 Curtis Stone: Look it was like seeing an old friend for the first time in a long time. I went back into the kitchen, and I’ll never forget the first night. We worked all day, we got into the kitchen at 8 or 9 in the morning, we prepped all day and we did the dinner and in some ways it was like doing an event, a press event, cause I was so used to working in television. We sort of got through the end of the night, we cleaned up and I thought, ‘wow, what an amazing experience. It went really well, everything went great.’ And then I stood there for a minute and I thought, ‘I’ve got to do it again tomorrow. And the next day, and then next day.’ So it was a culture shock for sure, but it’s like riding a bike. Larry King:Watch new episodes of “Larry King Now” Monday, Wednesday, and Friday on demand on Ora TV and Hulu.